Used to add a Google map to your page. This map can include one marker, or any number of markers. You can also show routes between markers. 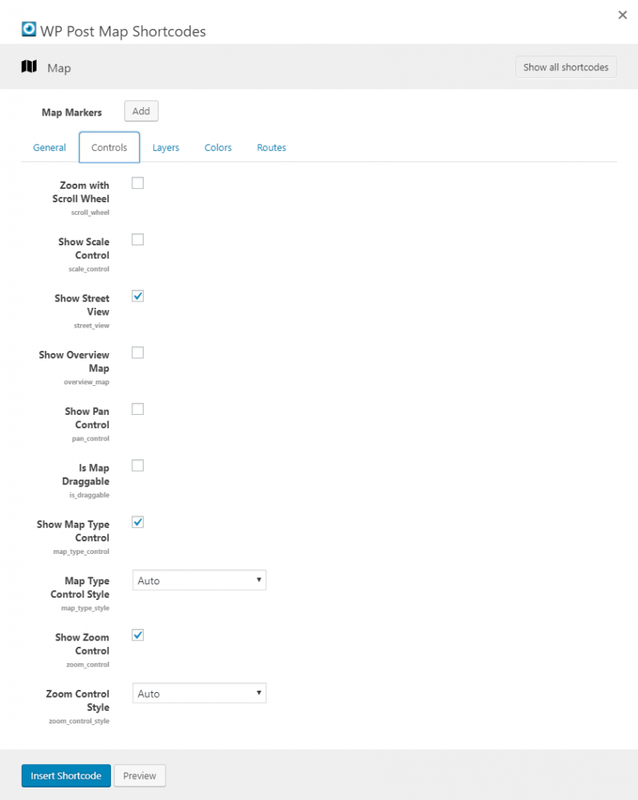 The options on the General tab allow you to set a number of standard settings for the map. This allows you to add an ID to the map, which sets the client-side ID. Select the type of map you want to show. Set the width of the map. The default is 100%. Set the height of the map. Default is 300px (examples: 100% or 300px). Set the initial zoom level for the map. Enter a number between 0 and 19 (0 = world, 19 = street). Default is 10. Fit map bounds to show all markers. This setting will force the zoom level to change so that all markers are shown on the map. This options allows you to select a shadow to show on the map itself. When a shadow is selected, you'll see a preview of the shadow to the right of the select box. Only add an address if you want a map to display with no markers. This will set the center of the map. Only add latitude and longitude coordinates if you want a map to display with no markers. This will set the center of the map. This allows you to add a CSS class to the map. Adding a CSS class might help you to style certain things. The options on the Controls tab allow you to setup how the map works and what shows on the map. If this option is checked, when you hover over the map, you'll be able to use the scroll wheel on the mouse to zoom the map. If this option is checked, the scale control option will show on the map. If this option is checked, the street view control will show on the map (where it is available). If this option is checked, the overview map will show on the map. This is a smaller map version. If this option is checked, the pan control option will show on the map. If this option is checked, you will be able to click and hold down the mouse button to pan around on the map. If this option is checked, you'll have an way to control the type of the map. With this, you'll be able to control if the map is showing a road map, satellite, or hybrid view. Select the style of the Map Type Control. The default is "Auto". If this option is checked, the zoom control option will show on the map. Select the style of the Zoom Control. The default is "Auto". The options on the Layers tab allow you to show additional layers on the map. 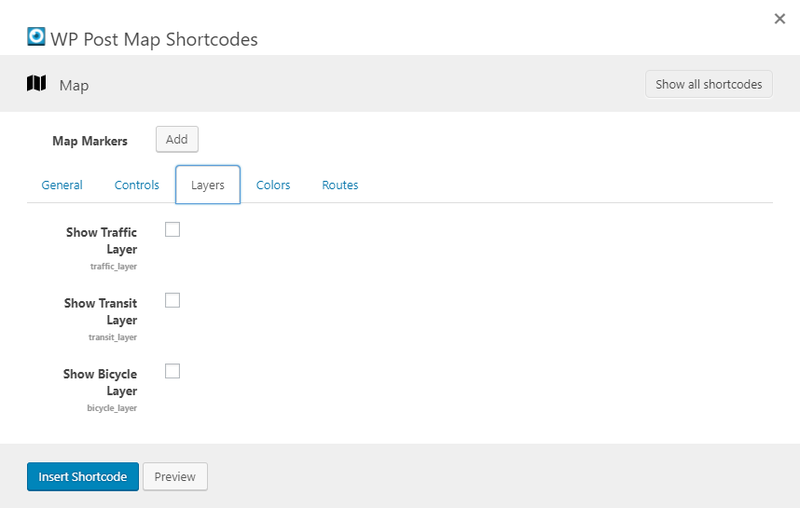 If this option is checked, the map will display the traffic layer. If this option is checked, the map will display the transit layer, which will display transit routes. If this option is checked, the map will display the bicycle layer, which will show bicycle routes. The options on the Colors tab allow you to set the colors of the map. If you have questions about color options, please check out this link. You can learn how to use the options and see the changes without saving and refreshing. The screen is a little confusing, but making changes to hue, saturation, lightness, gamma and invert lightness will get you going in the right direction. You can then take those values and plug them into the map options. This is the basic color for the map. Indicates the percentage change in intensity of the basic color to apply to the element. Indicates the percentage change in brightness of the element. Negative values increase darkness (where -100 specifies black) while positive values increase brightness (where +100 specifies white). Indicates the amount of gamma correction to apply to the element. Gammas modify the lightness of hues in a non-linear fashion, while not impacting white or black values. Gammas are typically used to modify the contrast of multiple elements. For example, you could modify the gamma to increase or decrease the contrast between the edges and interiors of elements. Low gamma values ( 1) decrease contrast. Inverts the existing lightness. 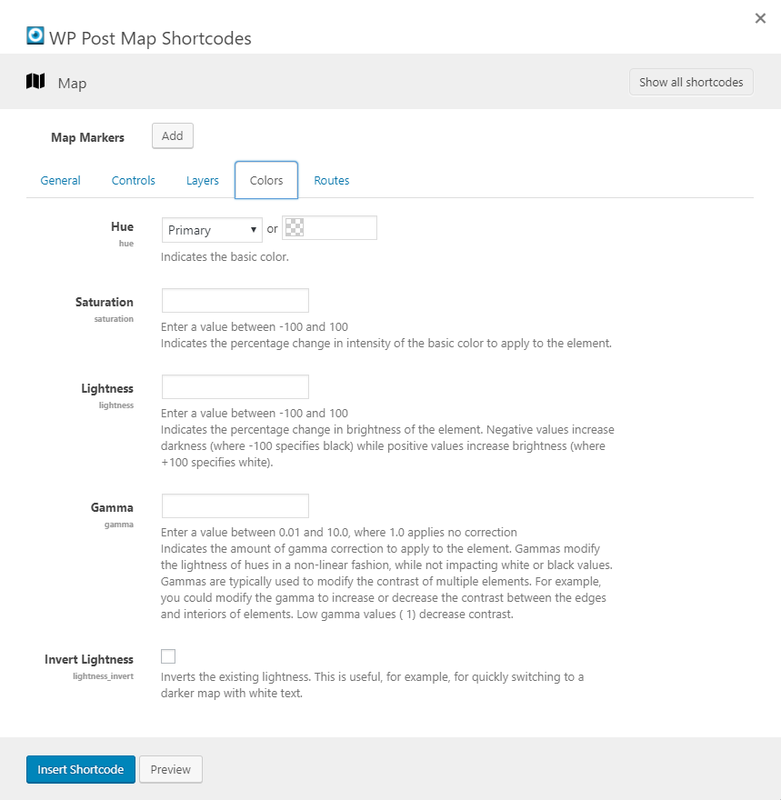 This is useful, for example, for quickly switching to a darker map with white text. The options on the Routes tab allow you to setup the map to include routes from the various markers that you add to the map. Check this if you want use routes. Check this if you want Google to determine the best route for points between your start and end address. Leaving unchecked will plot the directions in the order you have below. Check this if you want the End Address to be the same as the Start Address, making this a round trip. Select how you will be traveling. This will give you the proper directions and will show a more accurate time for the route. Check this if you want the route to avoid tolls. Check this if you want the route to avoid highways. 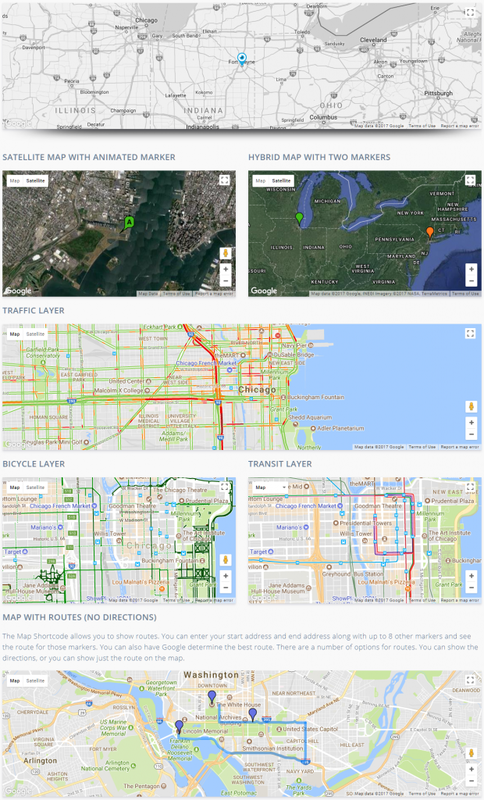 Select the color of the line that you want to be used on the map to show your route. Check this if you want to hide the detailed route directions, only showing the map and route. Set the title shown for each route (ex. "Route Segment", which will display "Route Segment: 1" for the first item in the route). Check this if you want to hide the detailed directions for each segment. Enter a start address for the directions. Enter a title for the start address for the directions. Enter a description for the start address for the directions. Select the type of marker that you want to use for the Start Address. Select the color of the marker that you want to use for the Start Address. Set a custom marker image to be used for the Start Address. 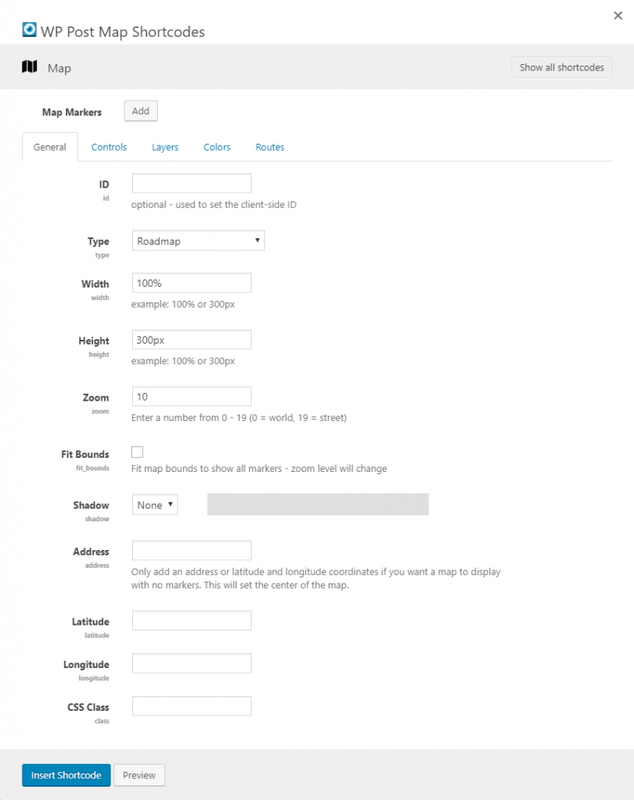 Enter a WordPress attachment ID or a URL - Suggested size is 32x32, anchor will be bottom center. Set a marker anchor to be used for the Start Address. 0,0 is the top left of the image/icon, so the anchor would be 16,32 for a 32x32 image/icon when you want the point at the bottom center - default is 16,32 if a custom marker or icon is added) examples... "16,32", "0,32", "0,16"
Enter an end address for the directions. Enter a title for the end address for the directions. Enter a description for the end address for the directions. Select the type of marker that you want to use for the End Address. Select the color of the marker that you want to use for the End Address. Set a marker anchor to be used for the End Address. The options in this section are for the Markers. Set the address for the marker. Set the latitude for the marker. If you have set the address, this is not necessary. Set the longitude for the marker. If you have set the address, this is not necessary. This option sets the title for the marker, which will show in the infowindow. 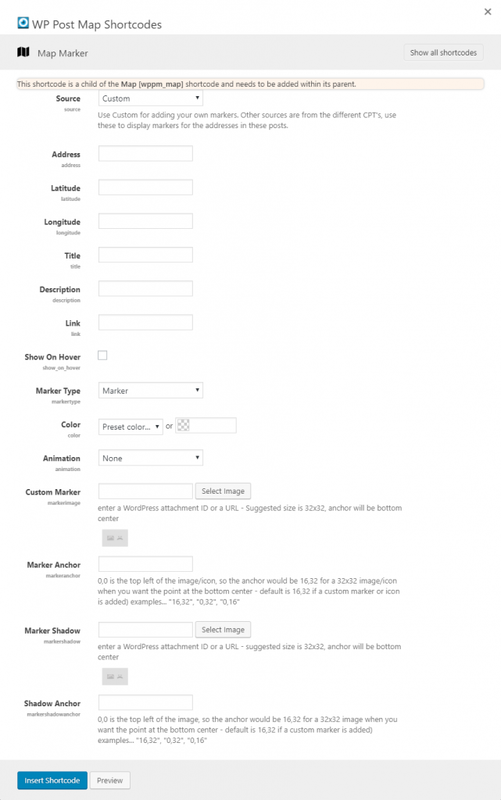 This option sets the description for the marker, which will show in the infowindow. Select the color that you want to use for the marker. Select an animation for the marker. Select an Icon Source. This option is only visible if you select "Icon" from the "Marker Type" dropdown. Select an Icon from this list, after you've selected an Icon Source. This option is only visible if you select "Icon" from the "Marker Type" dropdown. Set an icon height. This option is only visible if you select "Icon" from the "Marker Type" dropdown. Set an icon width. This option is only visible if you select "Icon" from the "Marker Type" dropdown. Set the text to show in the marker bubble. This option is only visible if you select "Bubble" from the "Marker Type" dropdown.